[Ed. There have been occasions when I have entered a gossip or meeting room only to be greeted by a whiff of whale oil and nostalgia, as someone has demonstrated with the appropriate equipment how it used to be done, 100 or so years ago. When I first became interested in rotifers I was living on a Scottish island. I bought a new microscope, and in the back of the catalogue that came with it the address of the Quekett Microscopical Club was listed. I wrote off, and when listing my interests my attention was drawn to the fact that Mr Eric Hollowday would be pleased to hear from me. Little did I know what kind of cat I was letting out of the bag! 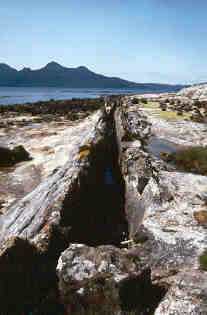 The Isle of Eigg is a delightful place for anyone interested in plants, birds and rotifers. 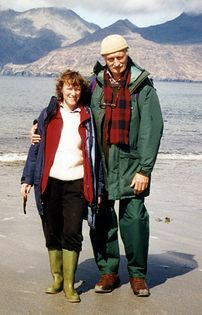 It has shore pools, hill lochs holding fish, and wonderful beaches where my wife has found around 150 species of shells. On the down side, getting supplies could be a problem. The trouble with being a lone worker was the lack of access to books, papers and suppliers that I needed. The cost of postal rates for buying books or loaning them from a library didn’t encourage one in one’s research, though the Highland Library in Inverness gave me a wonderful service, in fact much better than the service I now receive in Glasgow. My post could arrive wet through, having travelled by boat with the mailbags exposed to sea spray and rain. When I phoned orders to firms on the mainland, asking them if they could please send goods in plastic bags plus other wrappings, it fell on deaf ears. I think they thought I was some mad islander. My post could arrive at my door (if I still had one after the winter gales) at any time up to midnight. In the summertime it’s never dark, so island time-keeping falls by the wayside – rather frustrating when you are awaiting a much-needed book or paper, and the mail only comes twice each week, and the boat may not run if the weather is bad. Thank God for the phone, and more so for the call-minder service. Without electricity, an answer-phone is not possible. Normal island daily living cuts into your time. Shopping trips, firewood, posting mail, all take hours of the day away. You must stop and pass the time of day; also people’s comings and goings are big news on an island; plus, each summer the island receives visitors who have a real interest in birds, plants etc., and they are interested in what you are doing. A microscope seen through your window sets off new conversations and cements new friendships. People are more than kind, sending you things needed. You come to the point where you don’t say you require this or that, because people will send it to you after they return to the mainland and won’t let you pay for it. I do the same, now that I am town-based. The island is a wonderful place to be out collecting water samples. Freshwater rock pools receiving sea-spray hold freshwater shrimps and water-beetles along with rotifers. Visiting some of the small lochans and ponds in the summer entails a fight through five-foot high bracken and bramble thorns, which is rather hot when wearing Wellingtons and a strong coat to protect yourself. The views are breathtaking – the views across to the isle of Rhum and north to Skye, west to the outer isles, and east to the high mountains of the mainland, with all the seasons displayed before you, just for your delight. Your collecting net brings forth other joys to see apart from rotifers – Volvox and diatoms. You have to be disciplined and not to be distracted from the rotifers found in the samples. The spring and summer give you long hours of daylight, allowing plenty of time for collecting and use of the microscope. Viewing by daylight holds a special delight, which must be used often to understand its full potential; but come the winter, the short days and the long dark nights, I had only oil lamps to illuminate my reading and microscope viewing. Eric Hollowday kindly looked out papers about E. M. Nelson, the notable English microscopist. These papers showed the microscope lamp used and the other equipment also. I made up a microscope board, which was a great improvement – less set-up time needed. Both the broad face and the narrow edge of the oil-lamp flame were used. I could use a high-powered lens and the colours showed very true. While working before a window in daylight my eye could be drawn by gulls, seals or otters in the sea or on the shoreline – curlews, oystercatchers, redshanks, crows flying over the rocks, dropping shells on the rocks to break them. What’s that bird in the tree? Where’s the telescope? …bird book? Is that new snow on the mainland hills? Then a fishing boat crossing my view, the telescope again, reading the boat number, then working out by their boat gear what they are fishing for – trawling, or pots for prawns or lobsters. Having been a prawn and lobster fisherman myself, it was of real interest to me. Then a visitor would come to the door – put the kettle on – it’s never off on an island. One owns a bottomless coffee-pot plus a soup pan, always ready to hand. The bread is home-made. Why is it always the same when you have a visitor that’s interested in your work? You never have any newly-found rotifers to hand, in fact sometimes no rotifers to be shown at all. It’s back to drawings and photos. The year before moving to live in Glasgow I moved into a caravan. The cottage was being sold and I had a few months before I moved south. This brought me new views west over shore and sea, wonderful sunsets over the isle of Rhum, plus quicker access to the north side of the island, and a small lochan close to hand which I could visit almost every day, picking mushrooms in season on the way. Most of the lochs were dark with peat water, and some held plenty of plant life. The letters and drawings increased to the long-suffering Eric Hollowday, plus phone calls to clear up further points arising from these. I was still using oil lamps for the microscope work. I had Calor gas lighting, but the oil lamp more than filled the bill. I did later make up battery lighting using the 6-volt bulbs used in a battery-powered slide viewer. This was because I had a low power Vickers microscope, ×20 and ×60 without a mirror. Without this microscope I wouldn’t find half the rotifers which have come to hand. I was still using the oil lamp for my other microscope, a new Zenith Biolam biological microscope. On Eric’s advice, I bought a water ×40 objective for this – a very good lens. This microscope had a mirror and worked very well with my oil-lamp set-up. By now I had refined the stand, increasing the microscope board thickness to stop the shaking of the microscope when the gales shook the caravan. I remember one wild night – a night of driving rain and a force 9 gale – Eric rang up regarding a point in a drawing of a rotifer I had sent him. I happened to have the rotifer in question under the microscope lens. He asked me to check a detail regarding this rotifer. I had to ask him to hang on a minute until the gusts of wind passed and the caravan and my table stopped shaking. The need to have the oil lamp firmly clamped on the microscope board was a real necessity, demonstrated on a night such as this. 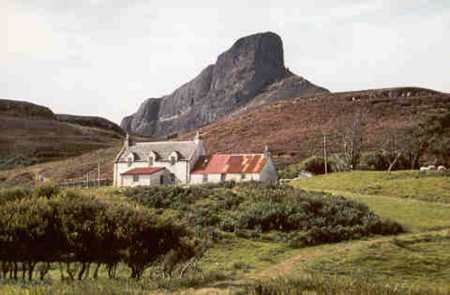 There were plusses also to studying rotifers on a Scottish island. No old cars or rubbish in the ponds; one could place markers around the lochs and ponds knowing that they wouldn’t be removed, and if you went across the other side of the island you could always find a cup of tea and time to catch up on the island news, and most likely a lift home over all the three miles of single-track road where you would see buzzards and, now and then, the golden eagle. Days to be remembered, given to just a few lucky people.